Trophy Skin RejuvaliteMD Anti-Aging Light diminishes signs of aging with red light therapy. The Trophy Skin RejuvaliteMD Anti-Aging Light is a breakthrough LED anti-aging device that combines the efficacy and intensity of the dermatologist's office with the comfort and convenience of a home use device at an affordable price. The RejuvaliteMD comes with a custom LED panel consisting of four powerful LED wavelengths of high intensity light that are proven to be effective at reducing signs of aging. Each LED wavelength penetrates to a different level beneath the skin, and each wavelength works to treat a different anti-aging concern. Use RejuvaliteMD in as little as 5 minutes, several times per week, for a simple, pain-free, and easy to use process that results in visibly improved skin tone, firmness, and a reduction in fine lines and wrinkles. Work it into your busy schedule by using it anytime of day or night. This kit includes: Trophy Skin RejuvaliteMD Anti-Aging Light, 100-220V Power Adapter, Protective Goggles, User Manual, 1-Year Manufacturer Warranty. Tell us your thoughts about Trophy Skin RejuvaliteMD Anti-Aging Light and receive 50 rewards points! I have been using this Rejuvalite on average about 5x/week for about 3 months. I noticed an improvement in forehead lines after about 3 weeks. They are still there, but they seem to be less deep. The beginnings of the vertical lines between my eyebrows have almost disappeared. After about one month, I noticed that the slight redness in my cheeks has faded, which is an unexpected bonus. My main skin concern was some dark freckling from the sun, which seemed to get darker and darker over the past 10-15 years, despite wearing sunscreen every day. After about 3 months, the freckling has started to fade and I no longer look in the mirror and cringe like I did just a few months ago. I still have a long way to go, but I am encouraged enough to continue using the Rejuvalite regularly. I note that the included eye protection (white, opaque) works better for me than a pair of dark-tinted eye goggles from a competing product. I keep my eyes closed during treatment. Even though the dark tinted goggles made my eyes seem more comfortable than with the white shields, I think the fact that you can see through the dark lenses and not through the white shields is a measure of how much light actually gets through. I say this because after using the dark-tinted goggles with my eyes closed, my eyes felt drier and irritated later in the day--something that I don't experience on days when using the included white eye shields. Quality light, easy/quick to use. I originally got this light to replace a light therapy mask that required a much longer wear time that produced no results. This light has been great with its 5 minute per day requirement. Hands-free, and I've definitely noticed a lessening of age spots and fine lines. My skin appears much healthier and younger-looking, in general. The product has higher fluency (30J/sq.cm/5 min according to the company) than other devices on the market, it has 4 light wave lengths, and it is really quick (5 min/treatment). You also don't need to hold on the device to perform the treatment. As far as the results I have seen, I believe there is a slight added plumpness to my face. 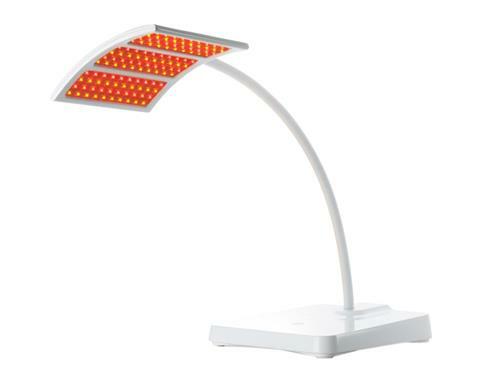 There are lots of studies on red light therapy proving that it works (e.g. NASA), and also on IR light. This is the reason I invested in this device, but I am still waiting on more visible results. I have used the device since July 17, but took long breaks from it because I was away from home for about 2 months. Let's say I used it for about 3 months.